Another week, another episode of the greatest anime of the past three years. 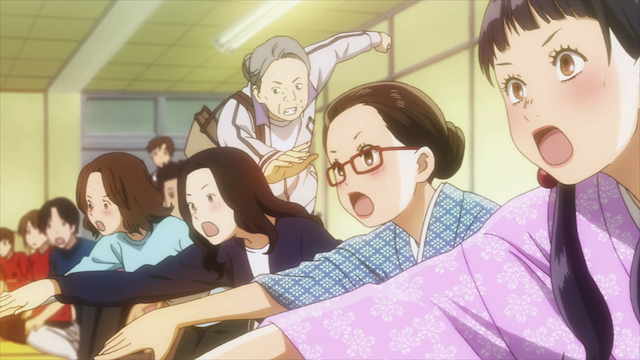 Chihayafuru season 2 episode 4 was more of the same, meaning more awesome than any other anime you are watching. How a series can be this consistently excellent, episode after episode, is beyond me. What I discuss in this post, instead, is what makes this episode a perfect sports show episode. 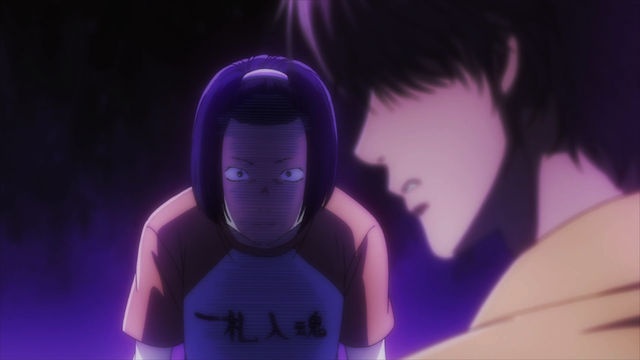 Now some folks might ask, “why do you think this episode was better than any other episode of Chihayafuru?” I don’t. This show is extraordinary in the sustained level of quality it demonstrates. Chihaya Ayase, Mizusawa High’s Karuta ace. To make a great sports anime you need to do two contradictory things. You have to make the audience believe that there is something special about the subject (in this case the protagonists are Misuzawa High’s competitive Karuta club) that makes them deserve to win. At the same time you need to convince the audience that they probably won’t win. If the audience believes only the latter, they will give up — nobody wants to see an endless string of defeats. If they believe only the former they lose interest, because there is no suspense. One way that shounen sports titles handle this is by constantly upping the level of the competition. Tournaments are great for this, because you can start with qualifiers, then move on to regionals, and then move up the ladders in the championship. 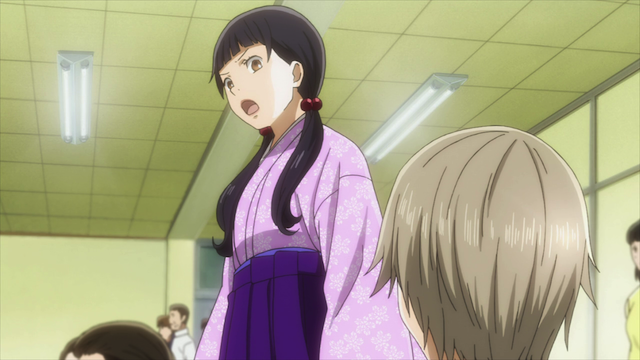 Chihayafuru has incorporated some of that. We are in the middle of the Tokyo regionals, and a win in this episode would only put Mizusawa High in position to play for the regional title next week. 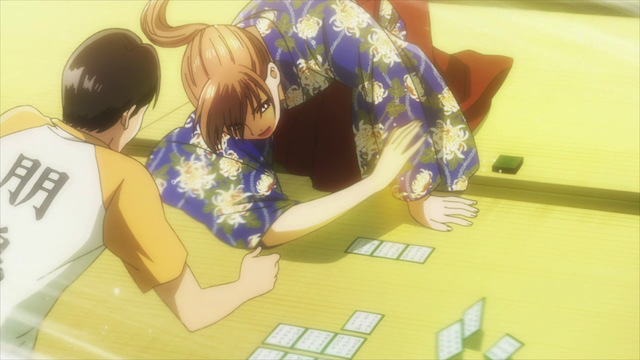 There is, however, another element, and this episode was yet another demonstration of Chihayafuru‘s great handling of it. Harada-sensei inspects Taichi Mashima before the match. As was demonstrated in the last episode, the five-on-five team matches mean that an individual win or loss isn’t the deciding factor in determining which team will advance. A weak player can lose to a very strong player, and it has essentially no impact on the match, if you consider that the very strong player was going to win regardless of who they were facing. In other words, stopping Mizusawa High’s winning streak doesn’t require taking on Chihaya, their ace. All that is necessary is to deny them the third win. Thus Taichi becomes the logical target. To convince the audience of the credibility of the threat, the episode begins (after some teasing about our friend in Fukui) with a discussion between Harada-sensei and some other members of the Shiranami Society about Taichi’s bad luck. Then it is revealed that the next team Mizusawa will be playing is a dark horse — this is already bad, because the lack of data prevents Tsutomu from offering guidance. The situation is even worse, however. 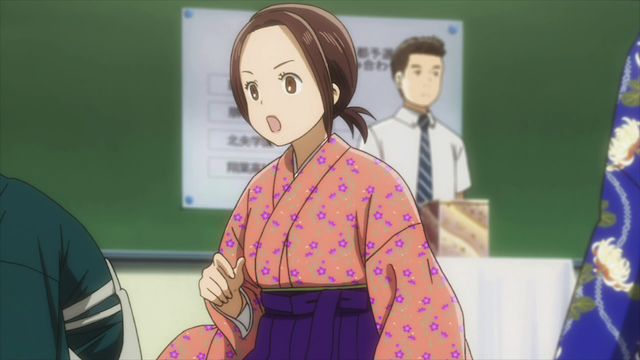 The dark horse team is being advised by Tsuboguchi, who is an excellent Karuta player, and as another member of the Shiranami Society, has known Chihaya and Taichi for years. Taichi’s opponent is a master of the dark arts. The dark horse team (Homei) immediately starts using psychological tricks, like flustering Chihaya with romantic overtures, with the real aim being to distract Taichi, and thus knock out the third leg of Mizusawa’s stool. When Taichi starts losing, his opponent pushes the advantage by pretending to have some sort of occult skill in calling out the cards that will be read. The real aim here is to cause Taichi to question whether he has the natural talent to win. With Taichi slipping into despair the match appears to be slipping away. 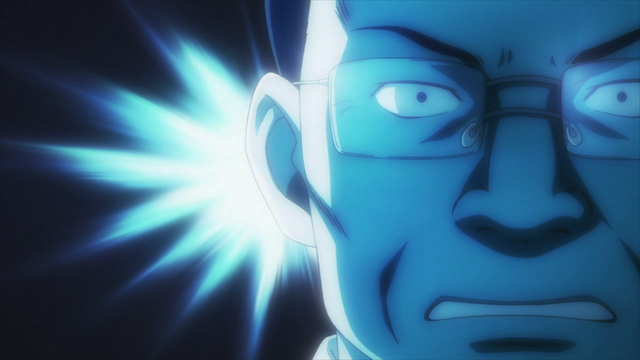 Harada-sensei does not approve of the way the poetry is being read. To make matters worse Mizusawa has two other handicaps. First the reader for the match was recently promoted to grade B, and is nervous in his new role. His reading is not following the proper rhythms, and his timing is bound to throw off an experienced team like Mizusawa more than newcomers like Homei. Second, the air conditioning unit above Mizusawa is broken, so they are playing in a punishing heat. As all of these problems crop up the Shiranami Society members from the beginning bemoan Taichi’s terrible luck. They even provide him with lucky talismans, but when Taichi reaches for a towel to wipe the sweat pouring down his face, he finds he only brought the talismans with him to the tatami mat. 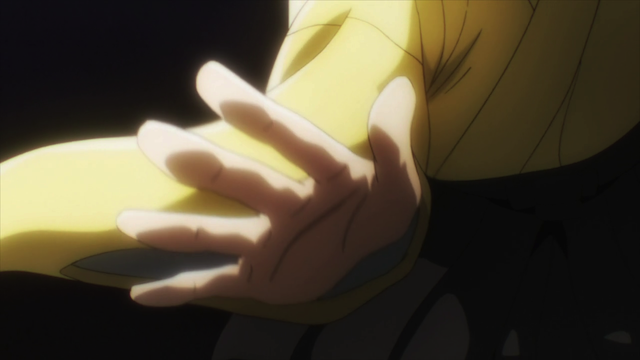 This is the climax of the episode. Taichi is broken, everything that could possibly go against him, has. Despite our belief that Mizusawa — that Taichi — is deserving of victory, we can fully believe that he will lose, and take the whole team down with him. The team that we believed would go all the way to the final round of the championship now looks like the underdog. Something extraordinary must happen, and fast, to turn this around! Team Taichi — all you had to do was ask. As is typical for this show, the gameplay is complex and satisfying. Much of what has been discussed so far is psychological, but even after Taichi manages (with the help of those around him) to snap out of his toxic mindset, he still has to play a very good game to end a winner. The solution lies in a strength that Taichi has demonstrated before, as well as a peculiarity of Karuta that was discussed at the end of last week’s episode. There are 16 cards that start with “The” (or whatever the corresponding syllable is in Japanese). This normally makes it difficult to move on those cards, since you need to wait until more syllables have been read, but Taichi was aware of exactly which other cards had already been called, so he was able to make “the” a single-syllable card. In short, through elaborate prepared layers of difficulties, the team that “should” win was turned into the underdog, with a seemingly slim chance of finishing on top. The turnaround wasn’t an instantaneous fluke that enabled them to skate to victory, it was an opportunity to use their innate talents and all of their hard work to make victory theirs in the end. Then, before we can get too smug about it, we get the reminder that a bigger challenge lies ahead: Hokuo Academy. Sumire Hanano on the march. Speaking of Hokuo, I was quite pleased that Sumire took the initiative to scout their next opponent. We’ll probably hear something about their secret weapon from her in the next episode, but beyond that, it is a very positive sign that she is taking her membership on the team seriously. She is starting to show, despite her distressing introduction, some actual potential, which is just another example of the kind of awesome Chihayafuru delivers regularly. 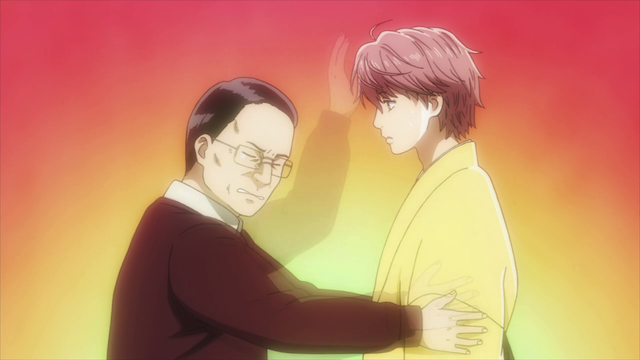 Words cannot express how awesome Chihayafuru is. Its been a long time since an anime series made me squee, feel excited and nervous all at the same time. ❤ I also love how perfectly imperfect the characters are. TL,DR: This episode is amaaaazing. Yeah, I am interested in seeing what kind of deal Arata struck with his parents as well. I do like the way Taichi evolved as a character, but I think it would be great for Arata to return and rejoin his friends. Then they will rule the tatami forever!